FOR MY third column examining some errors that are fairly common among beginning students, I want to look at thin cuts. These shots are among the most intimidating for developing players, and that fear can make improvement much more difficult. A major reason some players have so many problems with a thin cut is a lack of confidence. If you don't trust yourself when you approach a certain shot, you will subconsciously try to "steer" the cue ball toward its intended destination, instead of performing a smooth, natural stroke. When you steer a shot, your grip hand tightens up, which causes a lot more problems than it solves. So how do you develop the necessary skills to be able to trust yourself? Start by simplifying the situation. Diagram 1 shows a thin cut on the 1 ball into the corner pocket. With the cue ball one diamond away, begin practicing this shot. By starting close to the object ball, you are allowing yourself to get a feel for the cut, without unnecessarily raising the level of difficulty. What happens is that a lot of people try this shot at a significant distance. If you begin working on this shot from four diamonds away, you are going to become anxious and frustrated. When this happens, the fundamentals of your stroke will fall apart. The point here is to develop confidence and feel. 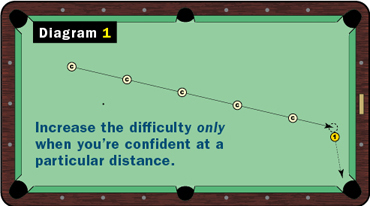 By starting at a close distance, you can stroke normally, without feeling the need to steer the cue ball. Once you feel comfortable cutting the 1 ball at this distance, back up a bit - keeping the same angle on the object ball. Continue increasing the difficulty of the shot as you get more and more used each distance. But, if you struggle to execute a shot successfully from a particular distance, don't be afraid to move the cue ball back toward the 1 ball. After you have spent some time working on these shots, you will be more confident the next time you're faced with a thin cut during a match. When you're not intimidated, you will relax and won't feel a tendency to tighten up on your grip.